Every spring/summer, I purchase a rosemary plant. Some years it’s small, part of an assortment of other herb pots for my porch windowboxes. Some years it’s a big plant that lives in a pot all it’s own. One year I bought a fancy overpriced heart-shaped topiary. It all just depends on what catches my eye. As the weather turns chilly, I bring it inside. The only thing that remains consistent is that every year, I proceed to kill it – every damn year – which necessitates the need for a new one the following spring. Circle of life, right on my back porch. This year, though, seems to be different. I brought the latest plant inside and it seems to be doing ok. Maybe we’ll make it. In addition to making sure the plant watered and warm, I need to use it because that will encourage the little dear to grow. What exactly is the point of growing herbs if you don’t use them? So today, on this snowy cold Bears Sunday when I probably should be making something warm and toasty, I made something sweet instead. Go figure. Over the summer, my community garden had a fundraiser and asked around for some help. Turns out there were quite a few “culinary types” amongst us. I felt that I’d been slacking in my contribution duties around the plot and gladly offered up my assistance. My assignment: make an assortment of cookies that utilized ingredients from the garden. I was stumped; my plot was definitely lagging behind my neighbors and immature vegetables pretty much dominated the space. Then a fellow gardener recommended working in some herbs, something that was growing handily about the place, in other plots. I suppose I was thinking a little too locally. Herbs I could do. 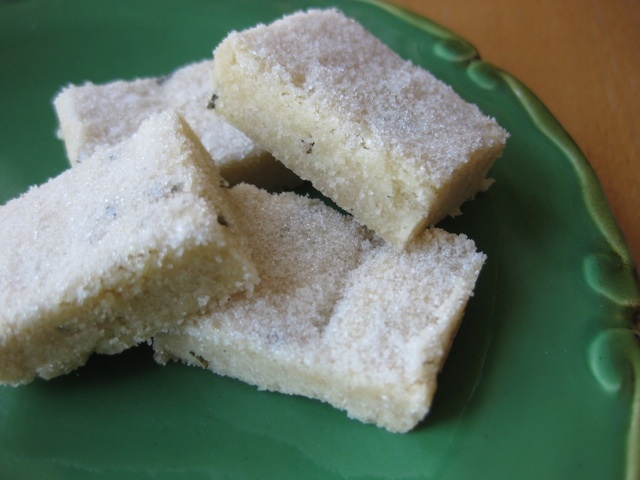 Among other things, I made a rosemary shortbread, something I enjoyed at a cookie swap the previous year. I dug through my notes and books and eventually found that very recipe. While it looked good, it seemed a little over-complicated with too many ingredients. Bah. 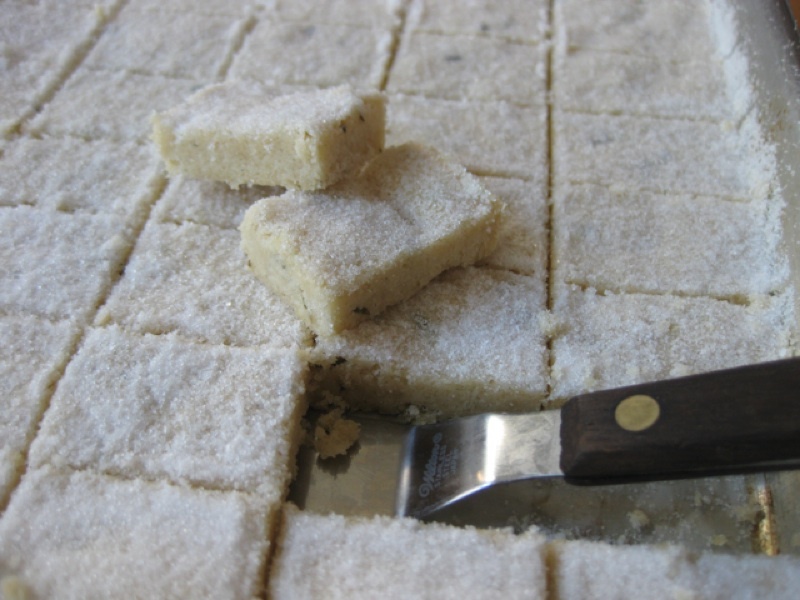 The best shortbread is always a fairly simple thing. Why overcomplicate what you don’t have to? So I opted to use a favorite recipe of mine, one I’ve adapted from an excellent cookbook writer, Flo Braker. With the addition of a little fresh rosemary, it was outstanding. This is delicious and buttery, just like a good shortbread should be, but with an interesting, curious herbal note. The flavor is a little haunting – at the start you get a crispy texture and rich, buttery flavor then comes a hint of something you can’t quite place. What is that? Then you realize … rosemary. Huh. Not at all what you expect. That little bit turns what can be a lovely but possibly one-note cookie into something wonderful that is just this side of savory. Rather great actually especially when you want something a little subtle. STRESS BAKING THERAPY FACTOR: TWO FAT BUTTER SMEARED THUMBS UP. Here’s what you do: you make a nice little pan of this then bring it into work and watch while folks gobble it up, wondering what that delicious flavor is. You smile, tell them it’s rosemary and watch as they give you a weird look, then gobble up another, just to make sure they like it. Make sure to push a few pieces off to the side for yourself or all that will be left is a few buttery, sugary crumbs. Preheat oven to 300°F and line a ¼ sheet pan or a 9”x9” pan with parchment paper. 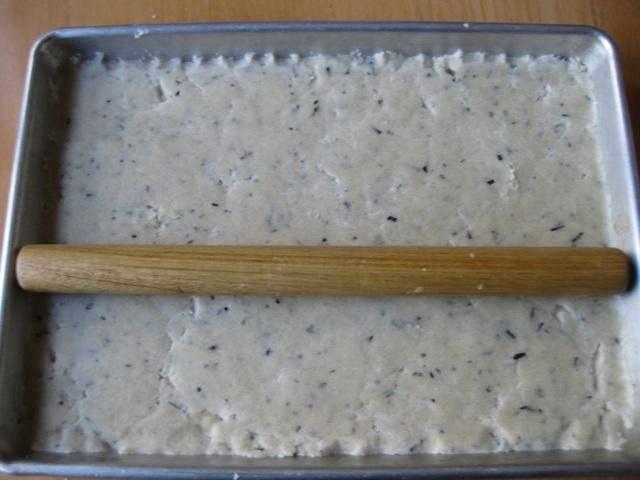 For the dough: In a medium bowl, combine the flour, rice flour, salt and rosemary. Set aside until needed. In a standing mixer fitted with the paddle attachment, cream the butter on medium-low until soft and creamy, about 1 minute. With the mixer running, add the sugar in a slow, steady stream and beat until creamy. Add vanilla paste, beat until just blended and scrape the bowl. With the mixer on low, slowly add the flour mixture until just blended. 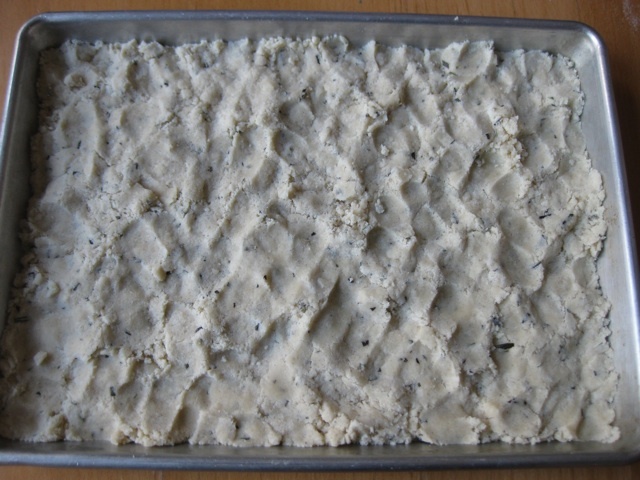 Turn the dough out into the prepared pan and carefully press it down until even. (I use a small rolling pin to make it even and smooth.) At this point, you can wrap the pan tightly and freeze it. Bake right from the freezer, adding a few minutes to the overall baking time. Bake: for a ¼ sheet pan, bake 40 minutes until slightly firm and very lightly golden. You don’t want a lot of color. If you’re using a smaller pan and the dough is thicker, add a few minutes to the baking time. You know the dough is done baking when it’s soft but slightly firm to the touch. Garnish: as soon as it comes out of the oven, pour the ¼ cup sugar on top of the warm shortbread and tilt the pan, gently back and forth, to evenly coat. 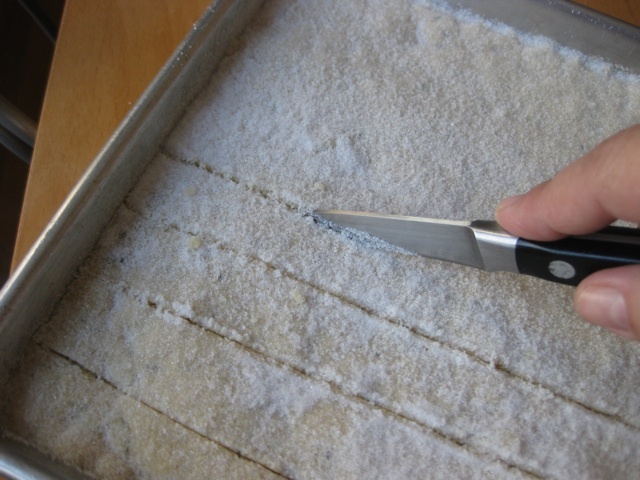 Cut: While still warm, take a paring knife and score the shortbread. I tend to like small, narrow rectangles, “fingers” if you will, pieces about ½” x 1”. But then, I like tiny cookies. Cut them any size you like. Let cool completely then carefully, with a small offset spatula, ease a piece or two out of the pan and continue until you can remove all of the cookies. Shortbread cookies will keep at room temperature about a week. on February 15, 2011 at 2:36 pm | Reply Bob C.
Rosemary is tricky to keep alive in the winter because the low light levels make it want to go dormant but the warmth of indoor living wont let it. If you want it to live in your apt you have to give it lots of light. 16 hours under a grow lamp plus a south window is not too much. This looks amazing! I hope this isn’t a silly question – what is vanilla paste? The filling you get from scraping the inside of a vanilla bean?